Our flanged rollers are available with either solid urethane with urethane flanges, or rubber vulcanized on a steel bearing housing with steel flanges. Our light- and medium-duty flanged rollers offer excellent mud shedding, while our heavy duty flanged rollers have a slightly tapered face to reduce mud build up and are the perfect choice for your most abrasive and demanding areas on your equipment. Kryptane® urethane on a precision machined hub with urethane flanges and a slightly tapered face. 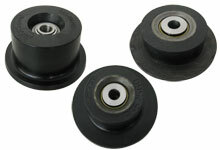 High-quality rubber vulcanized on a steel bearing housing with steel flanges. Solid Kryptane® polyurethane with two bearings and urethane flanges.